Life Coach and Breast Cancer Survivor Niamh Gaffney wrote this piece for us on how to come out of hiding after a cancer experience. My little boy loves to play hide and seek. He runs off and hides under the couch (with his bum and legs sticking out!). My daughter counts to 10 and then shouts, “Coming, ready or not, keep your place or you’ll be caught”. She spies him under the couch and she skips off around the house asking in each place, “Are you here?”, “Are you here?”. Each time she says it, he roars laughing and thinks he’s the best hider ever! Eventually he reverses out from his hiding place and shouts to his sister, “Here I am!”. He’s rubbish at hiding. But he’s getting better. Bit by bit he’s realising that the quieter he is, the harder he is to find. Bit by bit he’s realising that the more he covers up, the more he burrows away, the harder he is to find, the safer he is. At some point a child realises that if he hides some of who he really is, life can be a little bit easier, a little bit kinder, a little bit more comfortable, so he hides. He hides the book-loving part of himself for fear of being branded a nerd. She hides the sport loving part of herself to fit in with all the other girls in her class. He hides the scared part of himself when the bottle is passed around and drinks up. She hides the angry part of herself because young women don’t scream or shout. He hides the pain he feels because real men don’t cry. We all do it. We do it often enough until it becomes a habit. We repeat this pattern of behaving until one day we’ve forgotten those parts of ourselves ever existed. Having been impacted by a cancer diagnosis, you might recognise that the process caused you to hide even more things – maybe you hid your discomfort and pain so that your loved ones wouldn’t worry so much about you. Maybe you hid your devastation at your diagnosis by thinking of those who ‘had it worse’. Maybe you hid your loss of confidence by saying no to more and more things, by staying in more, by doing less. We can hide behind our diagnosis. We can let others take decisions that we should be taking. We can hide in plain sight, perhaps afraid that if we come out of hiding and ‘live’ again the cancer will come back and we’ll be even more hurt. As time goes by the shock and pain and loss of the cancer lessens, but the impact of our hiding stays with us until we have courage to come out. Until we have courage to come out from behind the label of the cancer patient. Until we have the courage to let it be simply another experience in our lives, rather than THE EXPERIENCE which totally and utterly defines us. Only when we take courage to come out of our hiding spot, to say “Here I am”, do we get to experience a life of contentment and of satisfaction. As a medical coach, my clients know I am ‘coming to get them’, to find the real person hiding under all those layers. The first step of this is self-awareness, and this is something we can all work on. Start to notice this week all the different ways you are hiding – are you biting your tongue instead of disagreeing with something, are you sitting on the couch instead of going for a walk, are you saying, “Ah, I won’t bother” to something you would actually love to do? As you sit there, in your comfortable hiding spot, ask yourself, what are you not doing that the old you would have done? What are you doing that you would never have dreamed you’d do? What are you hiding from? What are you saying no to? What are you saying yes to? The second step is to challenge yourself to come out of hiding, even in small ways, and see what happens. Force yourself to voice your opinion, go for that walk, to try Zumba, whatever it is you are hiding from. Just do it. Come out from your hiding place. Give it a go and see what happens. See how much really is in your control. See how excited and courageous this makes you. See how confident you become. See who you really are. 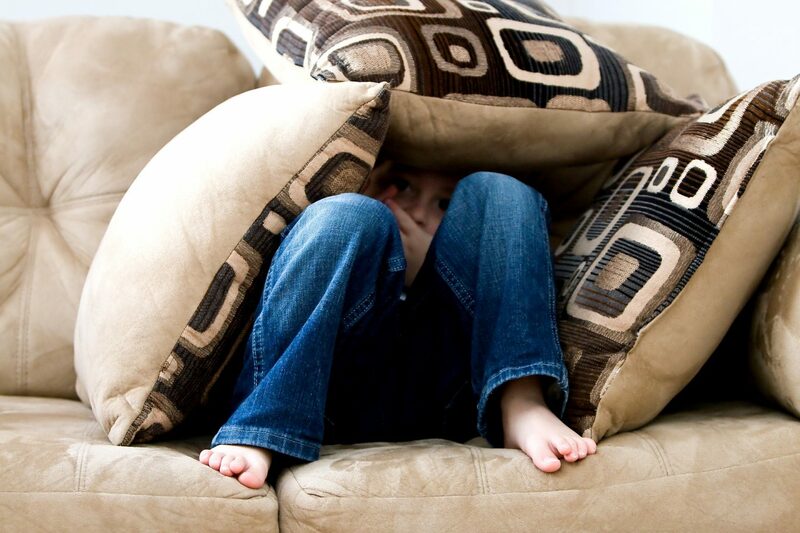 Try it, why not – all you’ve got to lose is a hiding place! Niamh Gaffney runs coaching consulting company Directionality. She is one of our regular contributors here on Happy Magazine. Niamh was 35 and a new mum to a gorgeous 6-month old baby girl when she was diagnosed with breast cancer. In the year that followed, she dealt with surgery, fertility preservation treatment, chemotherapy, radiotherapy and then faced redundancy from her executive level role. The fall-out of that crazy whirlwind of a year was a shock; she seriously struggled with the aftermath, with trying to get back to normal until coaching helped her realise that there was no going back – she needed to find her New Normal. When the dust settled she understood how much coaching could help others in similar situations and so ‘Directionality’ opened its doors in early 2016. For more from Niamh, find her at her website here.